In this excerpt from ‘How to Walk on Water and Climb Up Walls,’ David Hu explains why the wet-dog shake is so efficient. The following is an excerpt from “How to Walk on Water and Climb Up Walls: Animal Movement and the Robots of the Future” by David Hu. When I met my wife for the first time, she brought along a brown toy poodle named Jerry. He was a Valentine’s gift from her ex-boyfriend, and he proved the perfect subject for my next scientific experiment. I spent a great deal of time putting sticky notes on Jerry’s fur and filming him with a high-speed camera. Jerry did not like his stickers very much and tried to bite them off. If the stickers were on the top of his head or neck, he had another method to remove them. He shook his body and head back and forth several times, making me take a step back. His brown curls flew, sending dust and fleas in every direction, along with my stickers. This neat little trick, called the wet-dog shake, looked like a silly, useless act. As I analyzed the high-speed films, I learned that Jerry’s shake generated accelerations up to 12 times earth’s gravity, higher than the acceleration of a Formula One race car as it turns a corner. When I gave Jerry a bath, I found his shake could remove up to 70 percent of the water contained in his fur. It took only a fraction of a second, whereas our laundry machines take minutes to perform comparably. How is the wet-dog shake so effective? My student Andrew Dickerson and I built a wet-dog simulator, a rotating column that spun a clipping of Jerry’s fur at the same rates we observed. A camera was attached to the spinning frame so we could see drops releasing from patches of fur as it was spun. It was like we had a front-row seat to the water ejection process. On our wet-dog simulator, 12 times earth’s gravity was the minimal acceleration to remove the smallest drops from the fur. This regime exactly coincided with the acceleration that Jerry was generating. To find out if Jerry was alone in his ability to shake water, I scoured Atlanta for the biggest range of animals I could find, taking trips to laboratories on campus, the local park, and the Atlanta Zoo. Over the course of the next few years, the zoo would grow accustomed to strange research requests, such as, “Can we come film your pandas shaking off water?” Ultimately, we gathered high-speed films of animals across a 10,000-fold range in body mass, from a mouse to a bear. Bears shake at four times per second, dogs at four to seven times per second, rats at 18 times per second, and mice at a dizzying 29 times per second. The blink of a human eye would miss over 10 shakes of a mouse. Why do smaller animals shake more times per second? A smaller animal has a smaller radius, which causes it to generate less centripetal force. In order to generate the same drop-releasing forces as a larger animal, it must spin faster. Jerry’s owner brought me a lifetime of love and two wonderful children, who later would also become unknowing subjects in my experiments. I’ll tell you more about our adventures in the coming chapters. But I give credit to Jerry the brown toy poodle for buying me a ticket to my scientific obsession, the world of animal motion. 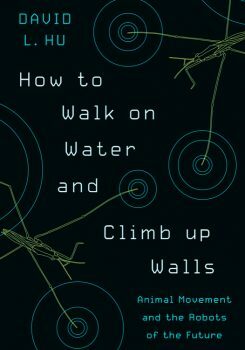 Excerpted from “HOW TO WALK ON WATER AND CLIMB UP WALLS: Animal Movement and the Robots of the Future” by David L. Hu. Copyright © 2018 by Princeton University Press. Reprinted by permission. What happens when you give hundreds of puppies a single bowl of food? This mechanical engineer is trying to solve this problem with physics…and maggots.